Kids thrive on routine. It brings a sense of calm predictability into their lives and helps build trust. Oatmeal is such a satisfying way to start your day. It's hot, it's hearty, and it's full of the things your body needs to get moving (and I don't just mean fiber, but it works every time, if you know what I mean). I don't know if my oatmeal is anything special; maybe it's not. Maybe you make oatmeal like this all the time. As I've stated in previous posts, it is hard to say what methods I take for granted as being common knowledge. So let me tell you about how I make my oatmeal, and you can compare notes. Let's start the liquid: I do a 50/50 mix of water and whole milk. I like the richness the milk adds, along with the extra vitamins and calcium. To the liquid, I add some butter and a pinch of salt . Yes, I said salt. Why? Practically anything you make in the kitchen - even sweets - can do with even a little bit of salt in order to bring out more of its natural flavor. I'm not talking fast food french fries amount of salt, just a pinch. Everything in moderation. Can I move on now? I start bringing this mixture to a boil over medium-high heat while I assemble the rest of the mis en place. Have you been paying attention in class? It means, "everything in its place," a French term used to portray the idea of having what you need where and when you need it. Getting the process going first helps cut down on the overall prep time - and I don't want to leave the girls waiting. Melt downs can happen at any time. Moving on to the oats: I use your run-of-the-mill (ha, mill, that's good; because oats are milled, right?) garden variety quick oats. Is there a garden variety of oats? I've never tried to grow them. Anyway, back to the lecture at hand. I know all about old fashioned rolled oats and steel cut oats. For this application, I need something that'll cook up fast, so quick oats are the way to go. On a side note, I use the old fashioned oats to make granola. Maybe I'll share that recipe another time. Also, you can often find either quick or rolled oats in the bulk foods sections of most grocery stores or specialty baked goods shops, which can save you some money compared to the standard Cylinder o' Oats. You know exactly what I mean. The rest of the recipe gets a little fuzzy, because there are so many potential variations depending on what you have on-hand in the pantry, fridge, and freezer. Let's break it down by category, shall we? Yes, we shall, cuz it's my blog and I'll write it how I want! Not that your kids need a big dose of sugar to jump-start their morning, but a little sweetness doesn't hurt, especially if it makes the finished product taste so good that they ask for seconds or even thirds! Sure, you could dump a bunch of white sugar in the pot and stir it in. Be my guest. Me? I like to mix it up a bit using things like brown sugar, maple syrup, and fruit spreads like apple jam, apple butter, monkey butter, or raspberry preserves. You can dice up fresh apple (peeled or not), mash up a couple of those overripe bananas, or drop in a handful of frozen blueberries. There's always the dried route as well, adding raisins, dried cranberries, dried apples, or banana chips. Cinnamon. 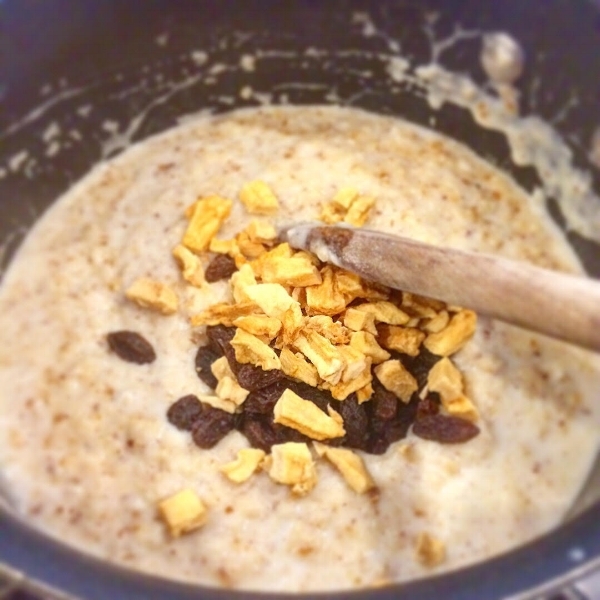 Oats love cinnamon. Feeling adventurous? Rummage around your spice rack and dust off the nutmeg, cloves, ginger, or (especially with bananas) allspice. 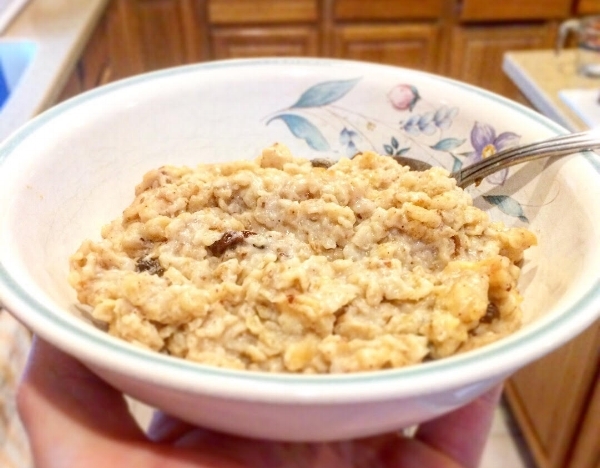 The two other ingredients I always add to my oatmeal are flax meal and peanut butter - flax for fiber (insoluble fiber to go with the soluble fiber in the oats) and healthy oils, PB for protein and flavor. There you have it - sugar, spice, and everything nice. Daddy's delicious oatmeal brings the kids to the table, and hey, it might get the same reaction from yours! I know it seems like a lot of ingredients on paper (or whatever material from which your smartphone is made), but looking around the pantry to come up with new flavor combinations gives you something interesting to do while you wait for the water to boil. Not only that, it becomes a really fun and engaging game for your kids: who can guess what's in the oatmeal today? I'm serious, it's a thing. My girls really get into it, which is great because they're learning what goes into their food and how different ingredients taste, and it's something they enjoy together with very few arguments. You want another cool thing about this recipe? It's easy to get your kiddos involved in the process. Maybe they can take turns helping you make it - measuring out liquid and dry ingredients, sprinkling in seasonings, stirring the pot. Have them help you pick what goes into it. There are few things more satisfying for a young child to 1) help their mom or dad, and 2) taste something delicious and know they had a part in it. Let me challenge you to make this for - or with - your kiddos once a week for the next four weeks, and see for yourself how something as simple as a bowl of oats can have a positive impact in your home. Send me a picture of what you've made and tell me about their favorite flavor combo. You can post it in the comments section on my Facebook page or send it to me via Messenger or email. Now get into the kitchen and make some memories! 1) Combine water, milk, butter, and salt in a medium sauce pan and bring to a boil over medium high heat. Keep a close eye, as it can go from bare simmer to boiling over before you know it. You're okay to move on to step 2 when you begin seeing bubbles breaking around the edges. 2) Add in the oats and cook, stirring, about 3 minutes. 3) Once the oatmeal has begun to thicken, add the sugar, fruit, and flax meal. Continue to cook another 2-3 minutes until it reaches the desired consistency (cook less for more runny oats, longer for more gummy, stick-to-your-spoon oats). 4) Stir in the peanut butter and spices. Heat through and taste for seasoning. Depending on the sweetness of the fruit or sweetener, you may need to add a touch more to taste. 5) Dish it up and serve immediately. If you have little tikes with sensitive tasters, drop an ice cube in their bowl. They'll love mixing it in and making it melt while it cools down their oats.